In the mid 1990’s the Saskatchewan Curling Association was in search of a sponsor for the Provincial women’s curling Championships. In 1997 SaskPower joined the curling family as the title sponsor. 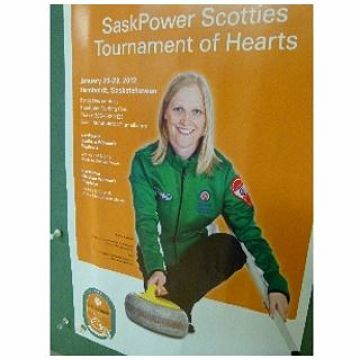 The Championship was known as the SaskPower Scott and in 2007 became the SaskPower Scotties. 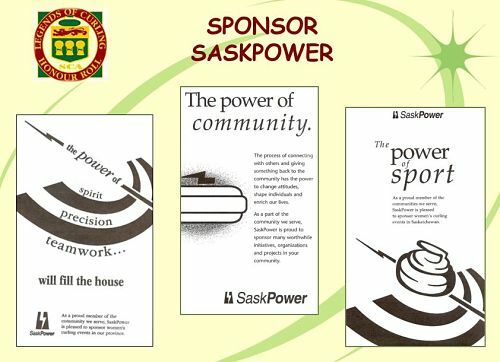 SaskPower continued as title sponsor until 2013, a period of 17 years. That is the longest sponsorship in the history of the Provincial Curling Association. SaskPower helped make the Women’s Championship one of the premier sporting events in the Province and for that we thank you. We also thank you for all of the support you gave over that 17 year period. It is our pleasure to acknowledge your contribution to the Sport of Curling by inducting SaskPower into the Legends of Curling Honour Roll and we are very happy to have Blair Speidel, Electrical Engineering Technologist with SaskPower, accept this honour on their behalf. The events SaskPower sponsored through this partnership were the SaskPower Northern Women’s Playdown, the SaskPower Southern Women’s Playdown, the SaskPower Scotties Tournament of Hearts Women’s Provincial and the SaskPower Natural Ice Provincial Curling Championship.